State Street and National Union merged in 1925. The merged bank took the State Street name, but National Union was the nominal survivor, and it operated under National Union's charter, thus giving the current entity its rank among the oldest banks in the United States. In 1966, the company completed construction of the State Street Bank Building, a new headquarters building, the first high-rise office tower in downtown Boston. In 1972, the company opened its first international office in Munich. In 1973, as a 50/50 joint venture with DST Systems, the company formed Boston Financial Data Services, a provider of shareholder record-keeping, intermediary and investor services, and regulatory compliance. More than 100 top staff from IBM were hired by State Street as it set about implementing IBM mainframe computer systems. By 1992, most of State Street's revenue came from fees for holding securities, settling trades, keeping records, and performing accounting. In 1994, the company formed State Street Global Advisors, a global asset management business. In 1999, it sold its retail and commercial banking businesses to Citizens Financial Group. 2019 State Street is scheduled to lay off 1500 additional employees even after beating performance measures. The company is laying off their United States work force and put an hiring freeze on all US operations to bolster their presence in India. The company is still committed to its goal of laying off 8,000 employees. The total net gain across the board is 3K+ after laying off 1500 Employees State side/ not filling roles as turn over continues over the last three years. The net gain of employment comes from their over seas operations. ^ a b c d "State Street Corporation 2018 Form 10-K Annual Report". U.S. Securities and Exchange Commission. ^ "State Street Corporation 10-K". SEC. February 21, 2019. Retrieved February 28, 2019. ^ "State Street Corp". Fortune. Retrieved 2018-11-25. ^ "2015 update of list of global systemically important banks (G-SIBs)" (PDF). Financial Stability Board. November 3, 2015. ^ "The First ETF Turns 20: Innovation That Leveled the Playing Field for All Investors Reaches New Milestone" (Press release). Business Wire. January 29, 2013. ^ a b Badenhausen, Kurt (December 18, 2012). "America's Best And Worst Banks". Forbes. ^ "Clipping from Boston Post - Newspapers.com". Newspapers.com. Retrieved 2018-05-22. ^ "History of State Street Corporation". FundingUniverse. Retrieved 2018-05-22. ^ "Two Big Banks in Boston Slate Union Into 2d Largest in Area". The New York Times. December 21, 1960. 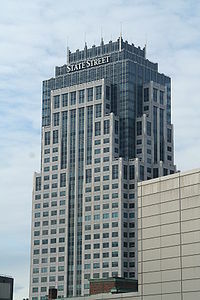 ^ "State Street Celebrates 10th Anniversary of its Kansas City Operations" (Press release). Business Wire. January 31, 2005. ^ ""We represent roughly 25% of the fund industry"". The Business Report. January 22, 2018. ^ "State Street will become largest securities services firm". USA Today. November 5, 2002. ^ "U.S. Bank to Acquire State Street's Corporate Trust Business" (Press release). Business Wire. August 13, 2002. ^ "U.S. Trust Completes Acquisition of State Street's Private Asset Management Business" (Press release). Business Wire. November 3, 2003. ^ "State Street Completes Acquisition of Investors Financial Services Corp" (Press release). Business Wire. July 2, 2007. ^ "State Street is first to pay back all TARP funds". Boston.com. Bloomberg News. July 11, 2009. ^ Sullivan, Ruth (December 6, 2009). "State Street grows with Mourant purchase". Financial Times. ^ Herbst-Bayliss, Svea (December 22, 2009). "State Street buys Intesa securities services unit". Reuters. ^ Van Sack, Jessica (December 12, 2010). "Days to get longer at State Street". The Boston Herald. ^ Smith, Geoffrey T. (November 5, 2011). "Bucket List: G20 Panel Names Top Global Banks". The Wall Street Journal. ^ "State Street to Acquire Goldman Sachs Administration Services" (Press release). Business Wire. July 17, 2012. ^ "State Street Shrinks Hedge Fund Operations With Sale Of SSARIS Advisors To Management". Forbes. November 24, 2014. ^ "State Street Completes Acquisition of GE Asset Management" (Press release). Business Wire. July 1, 2016. ^ Stein, Charles; Levingston, Ivan (September 20, 2017). "State Street Embraces Artificial Intelligence". Bloomberg L.P.
^ "State Street Implements Leadership Succession Plan" (Press release). Business Wire. November 7, 2017. ^ Reosti, John (November 7, 2017). "Succession shoe drops at another big trust bank". American Banker. ^ Stein, Charles; Maranz, Felice (2018-07-20). "State Street slides on $2.6 billion Charles River Development acquisition". The Boston Globe. Bloomberg News. Retrieved 2018-07-20. ^ Team, Trefis. "Why The Pessimism Surrounding State Street's Acquisition Of Charles River Is Overblown". Forbes. Retrieved 2018-12-19. ^ "California sues State Street over pension funds". Reuters. October 20, 2009. ^ "Two Former Senior Executives of Global Financial Services Company Charged in Scheme to Defraud Clients through Secret Trading Commissions on Billions of Dollars in Securities Trades" (Press release). United States Department of Justice. April 5, 2016. ^ "Consent Order" (PDF). Massachusetts Secretary of the Commonwealth. February 28, 2012. ^ "UPDATE 2-Protester shouts disrupt State Street annual meeting". Reuters. May 16, 2017. ^ "State Street Corporation Agrees to Pay More than $64 Million to Resolve Fraud Charges" (Press release). United States Department of Justice. January 18, 2017. ^ Raymond, Nate (January 18, 2017). "State Street to pay $64.6 million to resolve U.S. fraud probes". Reuters. ^ "Ex-State Street executive cheated clients with secret fees: U.S..." Reuters. 2018-06-05. Retrieved 2018-12-24. ^ Stein, Lindsay (May 3, 2017). "EIGHT THINGS YOU DON'T KNOW ABOUT 'FEARLESS GIRL'". Advertising Age. ^ Kosoff, Maya (October 6, 2017). "FIRM BEHIND FEMINIST FEARLESS GIRL STATUE CAUGHT PAYING WOMEN LESS". Vanity Fair. ^ Sheffler, Cara Marsh (March 14, 2017). "The 'Fearless Girl' statue sums up what's wrong with feminism today". The Guardian. ^ Bovy, Phoebe Maltz (March 14, 2017). "'Fearless Girl' Statue Not The Feminist Icon We Need". The Forward. ^ Chesto, Jon (October 5, 2017). "Firm behind 'Fearless Girl' statue to pay $5m over equal pay for women, minorities". The Boston Globe. Wikimedia Commons has media related to State Street Bank. State Street Bank records at Harvard Business School.